Editorials from Theslowlane: I say no to most fasting. The body, like a river, if it has low throughput it stagnates, High throughput with high fiber and exercise is cleaner. I say no to most fasting. The body, like a river, if it has low throughput it stagnates, High throughput with high fiber and exercise is cleaner. 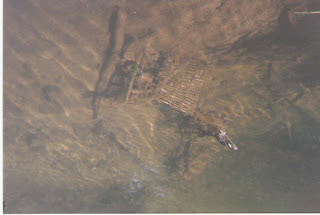 Someone tossed a market basket into the murky waters of Whatcom Creek. Photo from late 80s or early 1990s. Folks make money pushing various fasts and diets for cleansing the body. Most of these aren't much good. My diet for cleansing the body is the diet I have all the time. The old phrase "an apple a day keeps the doctor away." makes sense. When I was a kid, I changed the wording of that phrase to say, "an apple a day keeps the doctor unhappy." Basically that's if the doctor needs sick patients to make money. Fasts don't mean much to me, unless prescribed by a doctor for unusual circumstances. I think of the body as being like a river. When stuff is flowing quickly through it, the river is clean. When it's starved and stagnate, the river gets scummy. I say put lots of healthy and high fiber foods through the system. Cut back on fats and carbohydrates. And most importantly exercise a lot. Exercise may be the most important component to keep that healthy river of clean energy flowing through the body. Sometimes I don't pay too much attention to meticulous details of diet. An active lifestyle is great. When biking across USA, in 1991, I enjoyed the lean meat of a Buffalo Burger with plenty of vegetables. That was at the Wall Drugstore; a Disneyland style attraction in South Dakota. One sees the billboards for miles. On another note, I haven't been blogging much this week as my life has been full of local activities, friends and bike rides. Weather has been so nice that I've been riding the roads and trails, rather than sitting in front of my computer. This room that gets real hot in late afternoon. Rather than getting an air conditioner, so I can stay at my computer, I've been riding through the breeze with my bike and eating lots of apples.